Do you ever find yourself worrying about being robbed or vandalized while away from your home or business? When you go to sleep at night do you wonder if your family and possessions are safe from a late night intruder? It’s safe to say we all do, but simply worrying about these kinds of things is neither productive nor is it healthy. Rather than losing sleep, give yourself peace of mind. There is something you can do to protect your loved ones and possessions and lessen the likelihood of becoming a victim of intrusion. The most vulnerable areas of your home or business are the windows. 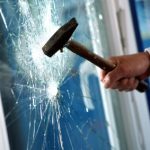 Glass is easily shattered, allowing burglars to creep right in. However, when a window is covered with Armorcoat Safety & Security Films and someone or something breaks it, the shatter-resistant film keeps the glass firmly in place. Not only will Armorcoat Safety & Security Films keep intruders out, but it will also keep your family from injuring themselves on shards of glass, and prevent some of the damages to your home that can occur during storms and earthquakes. Armorcoat’s superior protection is used on most Federal Buildings in Washington DC., across the country and worldwide. Because it safeguards so many of the world’s valuable people and things, it has been tested for strength by regulatory agencies in many ways. They have attempted to blast it, break it, puncture it and peel it, but there is no getting past Armorcoat. While Solargard originally designed and manufactured this security film for government use, it has since been released to the public for private use. It is available in various thicknesses, from 4-18 millimeters, and can be applied with or without a tint. Armorcoat Safety & Security Films are also backed by a factory warranty to guarantee performance. Pacific Window Tinting is Oregon and Washington’s leader in security window film installation with 15 years of experience. We are also the Northwest’s exclusive supplier of Armorcoat brand safety and security films. If protecting your home or business is a priority for you – please call Pacific Window Tinting for your free Consultation. We are the Pacific NW’s Security, Graffiti and UV Protection Experts!